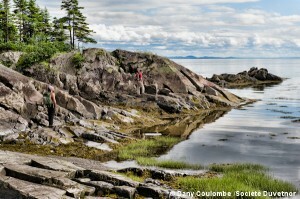 Off Rivière-du-Loup, in the Bas-Saint-Laurent region, there is a cluster of islands that are still wild and uninhabited. Protected by Société Duvetnor, the Pèlerins Archipelago, Pot Islands and Île aux Lièvres (Hare Island) are surrounded by marine mammals and home to bird colonies and seal haul-outs. Two of these islands are accessible to the public: Pot à l’Eau-de-Vie (Brandy Pot) Island and Île aux Lièvres (Hare Island). Keep reading to learn more! From the boat that will take you to Pot à l’Eau-de-Vie Island, you will soon spot the red and white lighthouse that stands guard over this pristine environment. Although it’s not the most imposing lighthouse on the St. Lawrence, it is one of the most charming: the tower and light keeper’s house are combined in one building, which also means you can spend the night in the lighthouse. Three comfortable rooms furnished in the spirit of the 19th century are available in this historic building. Imagine falling asleep to the sound of the waves and breathing in the fresh sea air as you wake… How can you resist? Several packages are available. Pot à l’Eau-de-Vie Island is also known for its bird colonies. Common eiders, razorbills, double-crested cormorants, great blue herons and many other species nest here. As a result, you have to wait until early July to have access to the entire island since certain areas are off limits during nesting season. Closed trails are clearly marked and it’s very important to respect the signs. The Pot Cruise will take you on a cruise around the archipelago (without stops). Observe beautiful scenery as well as marine mammals and seabirds as you listen to fascinating commentary about local maritime history. Duration: 1h30. The Îles du Pot will introduce you to the flora and fauna of the archipelago. This cruise lasts 2h30 or 3h (the longer cruise includes a visit to the lighthouse). The extra half hour is well worth it! Located near Pot à l’Eau-de-Vie Island, Île aux Lièvres is 13 kilometres (8 miles) long and provides hours of hiking opportunities. In fact, hiking is the island’s main attraction: you can follow 45 kilometres (28 miles) of trails for all levels through the forest and along the shore. Here again, certain areas will be off limits during nesting season. Note also that other measures are in place to protect the island’s ecosystems; for example, it is forbidden to cycle on the island or sea kayak near it. If you only spend a day on Île aux Lièvres, your excursion will last from 3 to 9 hours depending on the tides. As soon as you arrive, you’ll be given a map containing all the information you need about the trails (location, length and level of difficulty), services available, etc. You can then easily explore the island on your own and discover its forest, shores and wildlife. While grey and harbour seals await you at the eastern tip of the island, the north side is the best place to observe minke and beluga whales. In addition, birds of all kinds can be spotted all over the island. 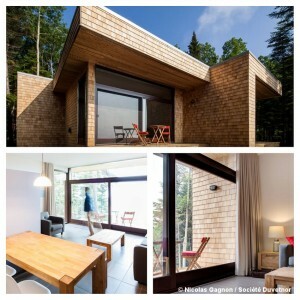 To make the most of your visit to Île aux Lièvres, I recommend that you spend at least one night on the island. You can stay at Auberge du Lièvre (which has a dining room), rent a cottage or enjoy wilderness camping. If you don’t stay at the inn, the Café de la Grande Course serves sandwiches soups and hot and cold beverages at mealtimes. A few non-perishable food items are also available for sale. Have I convinced you that an adventure on Pot à l’Eau-de-Vie Island and Île aux Lièvres is for you? If so, I recommend that you book your trip in advance by calling Société Duvetnor at 1-877-867-1660. Have a great trip!